As already mentioned, Pot Limit Omaha (PLO) is a high variance game, where it’s quite conceivable for two players to be mathematically correct in committing their whole stacks. The made hand versus a draw is a common scenario in the game, with the latter looking to bet the draw as a semi-bluff. There is a greater element of ‘gambling’ in PLO than NL Hold’em – it is far more volatile. • Because of its high variance nature, stricter bankroll management is required compared to NL Hold’em. Where as you can beat lower limit games in NLH quite comfortably with ‘20 buyins’ (This symbolizes 20 full table buyins for the limit – so at $0.25/50 stakes the full buyin would be $50 – 50 x 20 = $1000 bankroll), in PLO I would advocate far more. Someone who is guilty of overplaying two pair on the flop or chasing non-nut flushes in a full ring game – both common mistakes in PLO – is going to pay significantly over time. 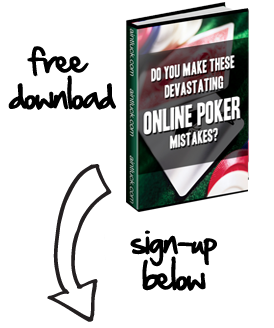 • A minimum of 30 buyins is required to play Pot Limit Omaha comfortably. So, for $0.25/50, this would amount to at least $1500. At higher limit games, from $2/4 onwards, I would stress closer to 40 buyins is advisable. Another rough marker for PLO bankroll management is never risk more than 3 or 4 % of your bankroll at a single table. • Shortstacking does not reduce the overall bankroll requirements, this is a common misconception. Playing with shorter stacks restricts your ability to seize pots without a showdown. Your also going to commit your full stack far more with hands such as middle set, which in a full ring game, is vulnerable to re-draws. • Its volatility means that PLO can trigger the wildest tilting. You can be playing perfectly and losing stack after stack, such are the frequency of ‘coolers’ in this game. As soon as you start loosening up pre-flop though, it’s time to quit. I would recommend taking a break if you lose three full stacks at a table, regardless of whether you think you can still play optimum poker. • Play the people and the cards. In 6 max, and especially full ring games, play tight before the flop. Hands such as AKJ8 single suited may initially look favorable, but should be discarded. Look to play high wraps and Ace high double suited cards. The Hutchinson system assigns each starting hand a ranking, and can be employed as a rough estimate. Weak, calling stations that chase non-nut flushes and overplay marginal hands such as two pair should be exploited to the maximum. Rolf Slootboom proposes sitting to the left of a maniac who constantly pot bets pre-flop in a full ring game, and waiting to exploit his loose aggression with a pot size raise yourself. • Implied odds (How much extra money will you probably make if you hit your hand?) and bluffing rights (Can you bluff your opponent out of the pot if a scare card comes up?) should influence your decision making when playing a strong drawing hand on the flop. If the flop is seemingly dry for your opponents, say a 10h 5s 2h and you hold Ah3hxx, consider blasting in a pot size bet right there. You may elect to ‘float’ in certain circumstances. Say you are head to head with a weak, passive player, who checks all his draws and only leads out on the flop with 2 pair or greater. The flop is As, Kc, 2s. Your opponent bets half the pot, and you suspect he has two pair, aces and kings. If another spade comes on the turn, it symbolizes a ‘scare’ card, and your opponent will no doubt fold to any sign of strength.